Flanders/ CSC is a wholly owned subsidiary of Flanders Corporation providing air filtration Systems for industrial, research and military facilities that handle dangerous or toxic biological, radiological or carcinogenic materials. Flanders/CSC containment air filtration systems are high quality, high efficiency systems designed to capture dangerous toxic, or noxious airborne contaminants, both gaseous and particulate, and to contain them until disposed of properly. Flanders/CSC Corporation’s filtration products are used by many other industries, including those associated with general ventilation and air conditioning systems, Department of Energy containment filtration systems, Department of Defense CBR systems, also known as NBC systems, hospital TB isolation rooms, pharmaceuticals, genetic and biotech facilities, universities, nuclear power and nuclear materials processing. All products manufactured by Flanders/CSC meet all of the basic requirements of ASME NQA-1 "Quality Assurance Program Requirements for Nuclear Facilities". Bubble-tight isolation dampers. Flat blade and dish type. Standard, manual hand wheel actuator. Optional, pneumatic or electric actuators available. Variety of sizes and configurations available. To contain prefilters, HEPA filters and carbon adsorbers. Stanless steel construction. ASME AG-1, N-509 and N-510. ASME NQA-1 Quality Assurance Program. ASME Section 1X. Variety of sizes and configurations are available. 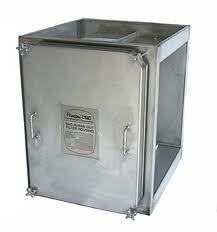 Non-bag-out containment housing also available. System can be provided with in-place test sections for efficiency or scan testing. Vertical and Horizontal Air Flow Designes. Standard products arranged to customer's application. Vertical or horizontal airflow directions. Carbon Absorbers, also known as High Efficiency Gas Absorers, (HEGA's) are most often used in "containment" air filtration systems. Containment air filtration systems are very hih quality, high efficiency systems, used to filter and contain dangerous particulate and/or gaseous contaminatnts. Containment sytems are most often designed to treat exhaust air from contaminated spaces, but occasionally are used in supply and recirculated systems. A HEGA collecs gaseous contaminants from an airstream through adsorption. With a properly designed system, any adsorbable containment can be filtered and contained. These HEGA's are available in both gel and gasket seal design. Available in T-304 stainless steel and polystyrene. Disposable, replaceable or refillable. 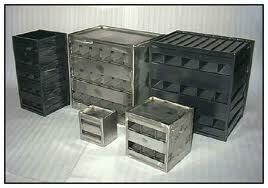 Total detention carbon filter housing. Higher removal rate of contaminants than low-efficiency partial bypass-type systems. Available in a variety of chemisorptive media or HMZD panels. Airflow may be upstream or downstream. Combines prefilters, primary filters and gas phase in a single unit. Rugged 16 ga. galvaneal frames. Uses HMZD bonded carbon panels to elimante carbon settling and dusting.